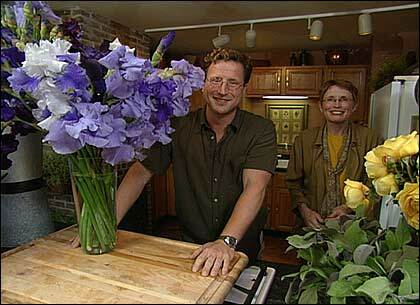 Robin Piselli joined Michael for a quick lesson in iris arranging. People often think of the iris as an outdoor-only flower, but they actually lend themselves well to beautiful cut-flower arrangements as well. Certainly it's fine to take irises straight from the garden and stick them in a galvanized bucket, as Michael Weishan says he often does; the flowers are easily gorgeous enough to take care of themselves. Recently though, arranging expert Robin Piselli joined Michael in his kitchen for a couple of quick and easy lessons on how to take arranging irises to the next level. First things first: Make sure you start with clean water, filled at three quarters of the way to the top. Over the next few days be sure also to maintain this water level, as the flowers will drink a lot. If you want, you can use one of the additive products  or, Robin says, a drop or two of bleach  to help cut down on any bacteria or algae that may want to form in the vase. Robin demonstrates how to overlap the stems to create a nice visual effect in a clear glass vase. Robin likes to arrange irises in a clear glass vase so their large green stems can add to the overall beauty of the display. Cut your stems at a 45-degree angle to create a large surface area for water to be absorbed; as opposed to a straight-across cut, the angle also keeps the stem from resting flat on the bottom of the vase, which will usually block water absorption. 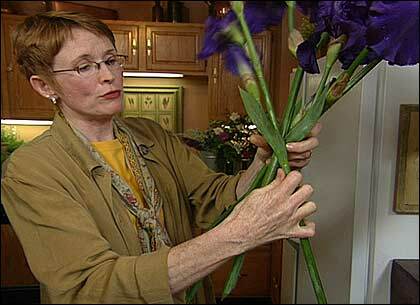 You should also remove any excess foliage from the stems. The first and slightly simpler of Robin's methods is to place the irises one by one in the vase so that the stems criss-cross one another. In addition to being attractive, this arrangement creates a support structure for the flowers that becomes stronger the more irises you add. The iris stems settle into a graceful spiral that will accent the beauty of the flowers. Robin also demonstrated a fancier technique, creating a braided effect with the stems. 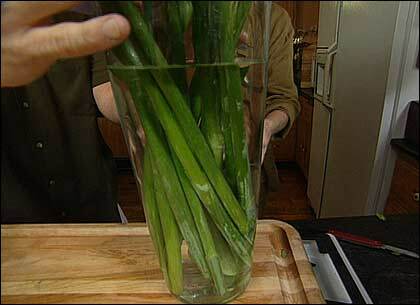 To do this, trim all your stems to the same length with a 45-degree cut. Then one-by-one take the stems into your hands, overlapping each one crosswise with the previous stem, like a collapsible fan, allowing the stems to twist into a bundle as you take more in your hands. (See the image above.) If you're working with a lot of stems it's helpful to have someone handing them to you. When you've got them ready, carefully place the bundle into the vase. The result will be a graceful spiral of stems that will enhance the visual effect of your arrangement. One final note on gathering cut flowers from your garden: Robin emphasizes that the best time of day to cut flowers is early morning, after the cool of the night has restored their vitality. Otherwise, cut them after sundown, when the flowers are filled with food. What you always want to avoid is cutting flowers in the heat of the day, because they'll be stressed and limp from the sun, and not as able to cope with the trauma of being cut. See our Resource Directory for more information about these products. This segment appears in show #2707.